A few issues back, the Overlander crew took their long-term Prado test vehicle through some pretty rough terrain - across the Simpson Desert and far western NSW. While these tracks are harder on your 4WD than tootling around the ‘burbs, they are by no means out of the question to your average Overlander explorer, so kitting out your 4WD to handle these conditions should be high on your must-do lists. One of the main complaints of the test Prado was aimed at the shocks – they couldn’t handle the corrugations and constant pounding of pot holes and ruts with just a moderate load on board. Step up, the newly-released, Tough Dog replacement strut that boasts a 9-stage, externally-adjustable (optional non-adjustable shock), 40mm bore shock absorber with totally re-designed coil rates specifically for the Prado. The lads at Tough Dog 4WD Suspension have been working on this replacement strut for some time, by fitting prototype shock and coil combinations to none other than Slav Stefanuiks’ very own Prado. Slav has amassed just shy of 30,000km while trialing the various coil rates and shock settings of the Tough Dogs and tells Overlander that the final strut kit is a huge step up in suspension quality; “these struts provide more ‘feel’ and ‘control’ while driving on corrugations and eliminate the vagueness and understeer of the standard Prado. With the slightly raised height of the coil springs and the improved dampening effect of the shock absorbers, the Prado doesn’t bottom out as easily when hitting ditches and also provides adjustability for when fully laden or towing trailers” Slav says. Aside from the real life testing and feedback, Tough Dog utilise their own in-house test equipment and know-how to greatly improve on the OE Toyota kit of 30mm bore non-adjustable shocks and non-load carrying ability coil. One big advantage of these Tough Dog shock absorbers is the ability to fine tune each individual shock setting to suit your own requirements. So, front and rear, or left and right shocks can be all set individually. Why? – let’s suppose you’re running around town empty, save for the shopping, mum and the kids, you can provide a comfortable and subtle ride to keep everyone happy. Then, when you load up for a hard-earned weekend (or longer) camping trip, you can easily turn up the ‘firmness’ of your shock absorbers to better handle and control the increased weight while driving at faster speeds – on road or off. Remember, the shock doesn’t carry the vehicle weight, it controls it. When you get to the low range, bone-jarring sections of track, it’s just as easy to ‘soften’ the ride to allow faster acting (less restrictive) movement of the shocks – imagine that…mum and the kids are happy in all environments! If you’ve dished out for a new Prado and love it as much we did, but are less than impressed with the suspension, as we were, then regardless of whether you’re a ‘burb runner, a fully blown Overlander explorer, or even both – now this is the advantage of these adjustable shocks; you can enjoy the best of both worlds – then the new Tough Dog struts are well worth considering. All you need to do is dip into your pockets for $300.00 per strut (optional $200.00 per strut for non-adjustable shocks) to call them your own. Metals ain't metals – while BHP have ruled supreme for many years with the supply of quality SUP9 steel to most spring makers, technology has stepped in with an updated option. 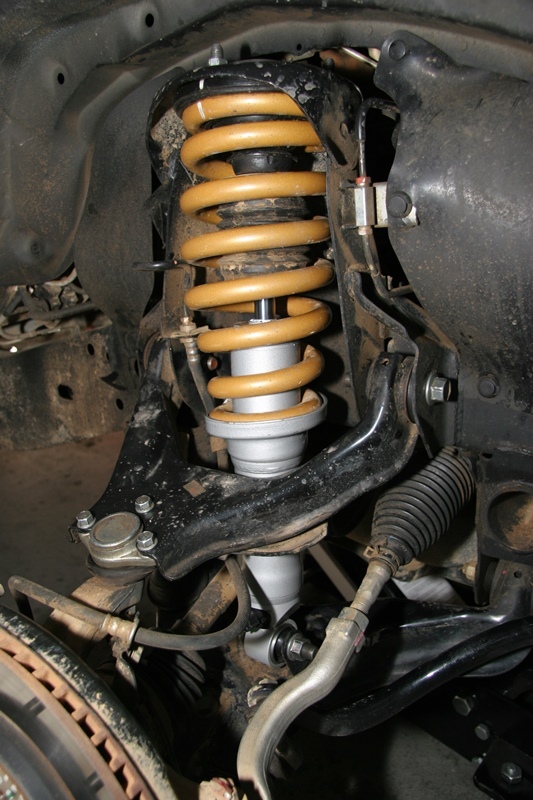 Germany’s X5K spring steel is now used for most of the Tough Dog range of coil springs. The higher quality allows for less material to be used per coil. A shorter length of steel means less winds (while still giving the same height), which also means less unsprung weight for the shock absorber to control. Less winds in the coil (overall from top to bottom) also allows for greater wheel travel, as there is less material (steel) to restrict full compression - binding. Tough Dogs’ utilization of the new X5K material, along with their design, enables high weight-carrying ability of a fully loaded 4WD. When that weight is removed, the 4WD will better return to its unladen height. As a result of the improved ability of the X5K material, some Tough Dog coils have been re-designed with slightly reduced diameter of wire used in the coil – leading to even more saving on unsprung weight. While this new higher-tech spring steel is more expensive per kg, the lower amount used in each coil means there is no increase in price – a win win situation. WHO THE HELL IS SLAV? Slav Stefanuik – funny sounding name maybe, but on talking to Slav you’ll hear as Aussie a sounding fella as you’ll ever get. Slav’s background of having competed in a great variety of motor sports (speedway, rally and 4WD) combined with being the founding director of BBM Motorsports, Revolution Racegear and 4WD Megastores, as well as avid 4WD tester, gives him the practical know-how of what a suspension set-up should do and feel like under most conditions. Slavs ability to relay information and suggest improvements is why Tough Dog entrusted the field work part of the Prado strut re-design to him! By the time you read this, Tough Dog will have replacement struts available for Toyota 200 Series, Mitsubishi Triton, as well as many other 4WD’s. Overlander where lucky enough to have spotted both the 200 and Triton versions while squirreling around the Tough Dog head office. If you’re after more information on these replacement struts, call (02) 9672 8899 or visit www.toughdog.com.au.